Here’s my Zigzagatory Camp oopy project — it’s hard to tell but it’s folded in half and on the left side you can see the circular needle. I just have from the needle down to the tip of the back half left to knew. Here it is all opened out – not a great photo but I love the way it pooled on each end when I was increasing and decreasing to a certain number of stitches. Plus where the larger pooling area on the right side is, that’s where I started a second ball of yarn so that changed how things were sort of striping. I like it. Hopefully I’ll get it finished off this weekend. Fussy Cutting – what is it…. 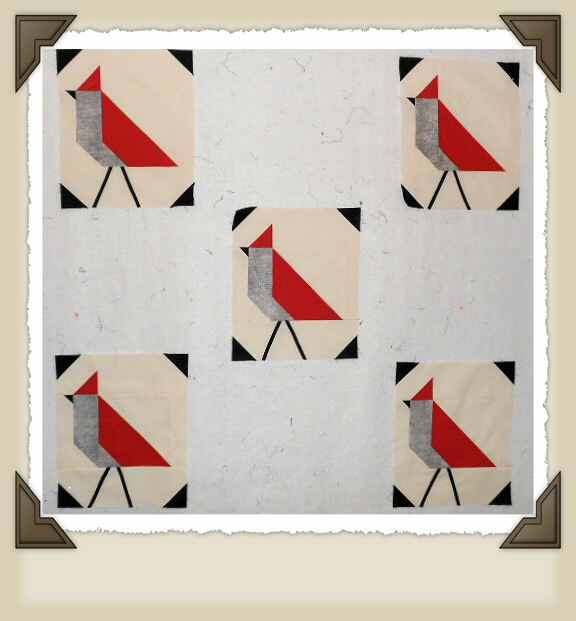 On the Camp Loopy sewing chat group there was a question about the fussy cutting I did in my bird quilt. So I decided to snap some quick photos to try to explain what it is and why I used it. Fussy cutting is basically just making the most of your fabric design and the way you cut that fabric. This is the project we were talking about on the chat group – I fussy cut two of the fabric prints to get them centered in the blocks they are used in. 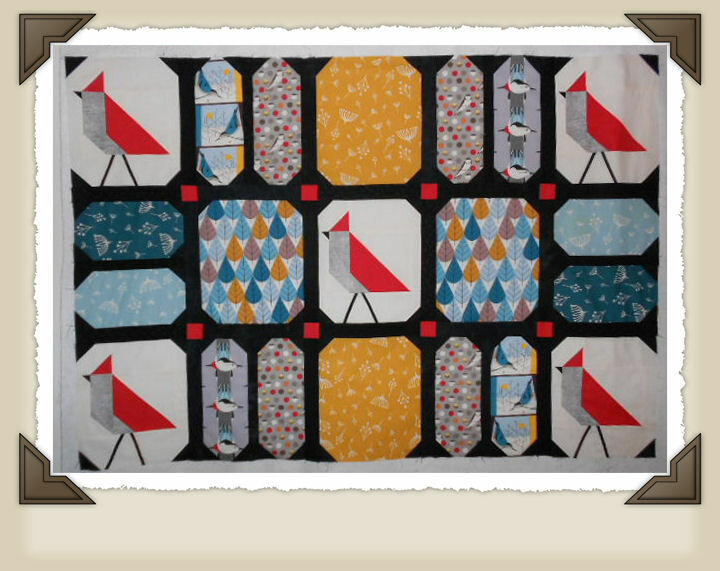 These two blocks were fussy cut to get the bird prints centered in the blocks. 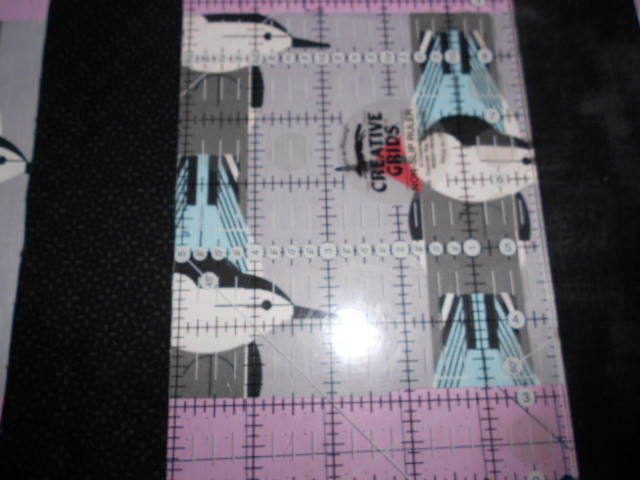 One of the fabrics I fussy cut was this one – the rows of birds are basically done as wide stripes across the fabric. That photo is just a scrap of what’s left over . For the particular block I was making I needed a 5″ wide strip. 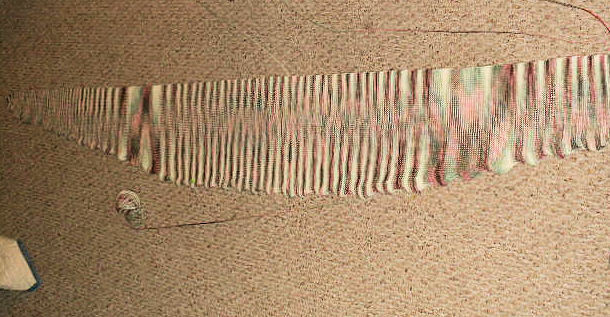 If I just started cutting at the selvage edge of the fabric as if I were cutting plain strips, I would have ended up with a strip that looked similar to this (I set black strips of fabric on each edge of the ruler to make it easier to see what the 5″ section would look like since my ruler was wider than that). As you can see I would be cutting off part of the bodies of the birds on the left side and cutting off their heads on the right side of the strip. So instead of doing that, I fussy cut it (and this fabric just happened to work darn near perfectly for the size strip I needed). 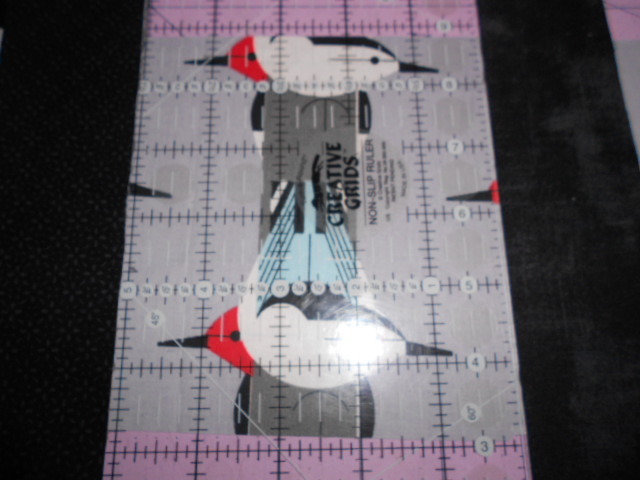 I get the full bird stripe and just the beaks of the birds on either edge (I bumped the table as I was taking the photo so my ruler shifted a little – I would realign it when I cut so that the little red head on the right side wasn’t showing. That’s all fussy cutting is. So if I need a second strip like that, I would be wasting a bit of fabric in between. Since I’ve cut the beaks off on the birds at the right edge of the strip in the last photo, I’d have to skip that row of birds with no beaks and move my ruler over to center it over the next row of birds to the right of that ( in this instance I’m wasting a partial strip of birds rather than cutting one strip butted up one right next to the other) so I could center it again, have just the beaks showing on each edge, and cut another strip to match the first one I cut. My little garden plot, where once again today I pulled out tons of weeds – pigweed is my nemesis – is doing pretty well. I’m waiting for that first ripe tomatoe – mine are all green and it will be a while before they ripen, but in the meantime I brought some back from my Dad’s and my sister’s gardens – he has red ones and she had some yellow ones to give me. They live only about 3 hrs away in Iowa but they are probably a good month ahead of us as far as growing season goes. But what I did find in my garden — more cucumbers. Nothing says fresh from the garden like sweet and sour dilly cucumbers (at least to me) and the dill was fresh from one of my pots too. I think it may be steak, cucumbers and corn on the cob for dinner tonight. Now back to cutting the outer borders for my Camp Loopy quilt. 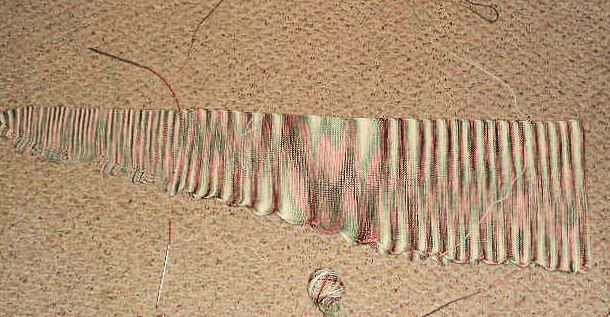 The rows and sashing are all sewn together. Could be I just might get to piecing the background tomorrow and getting it layered ..or I may just sit out on the patio and knit. I’ve only got about 5 or six rows on my Summer KAL sweater to do on the cowl before I bind that off and see if I like it or hate the cowl (I’m hoping I like it ’cause I don’t want to rip all that back out), and then I’ll just have the armhole trim to add and sideseams to stitch – and a whole lot of ends to bury. 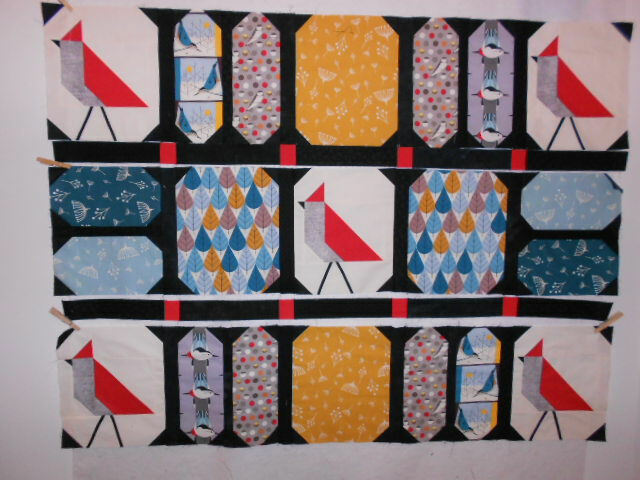 My plan last night was to get my five bird blocks done, which I did. Then to cut out the main pieces that make up the other blocks, which I did. But then I wanted to see how some of the blocks looked stitched together and since there were so few pieces to stitch for a block, ended up making all of them. And you know me – next I wanted to see just one row stitched together…. 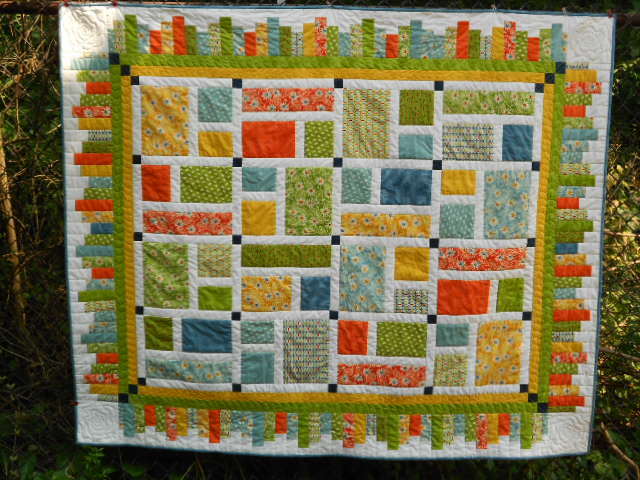 so when I quilt sewing in the wee hours of the morning, I had all horizontal rows stitched and the sashing strips in between made. 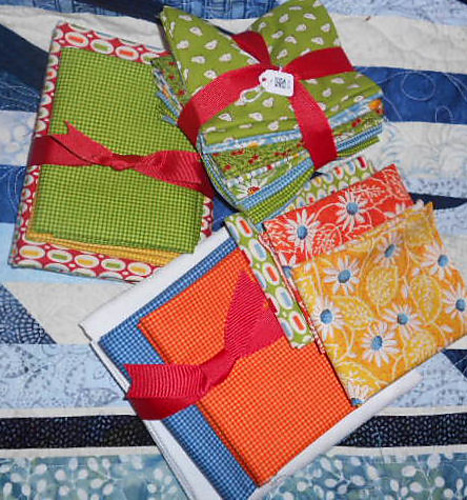 It was a bit tricky to cut some of the fabrics since for this Camp Loopy challenge you needed to use two Short Stacks (FQ packs). The blacks, tho they look the same in the photo were from one Short Stack of all black tone on tone fabrics. 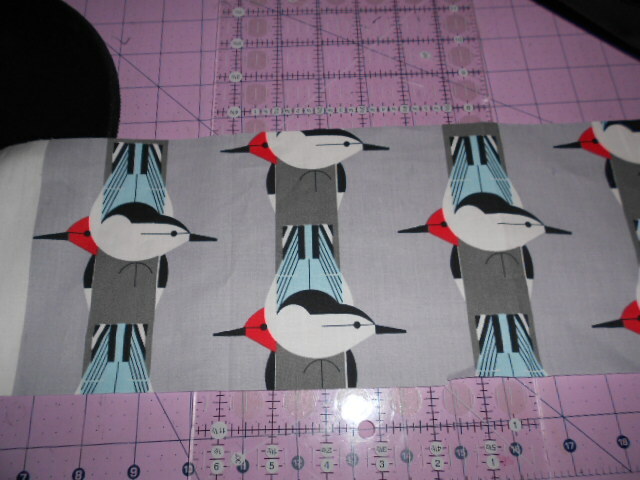 The nuthatches fabric (to the immediate right of the top left bird) and the other bird strip (to the left of the top right bird) I would have liked to put more of in the quilt – they are my favorites – but I had to fussy cut them so that always wastes a bit of fabric. There’s one fabric from the Short stack that didn’t make it to the front of the wall hanging so that one will be included in the backing. I’m contemplating ordering regular yardage of these fabrics and maybe adding in some of the other colorways to make a bed size quilt. Just have to sew these rows together and then cut the final black border that goes around it all. Here’s my Camp Loopy 3 knit project – Zigzagatory. This yarn started out making little stripes where I cast on at one edge. Then, as I increased stitches, it became wider looking stripes with more cream in between and the cream color mostly on the top edge, and now, where I have the widest portion, it’s starting to pool. It gets much longer but I think I’ve already done a couple of extra stitches beyond how wide the original pattern is. 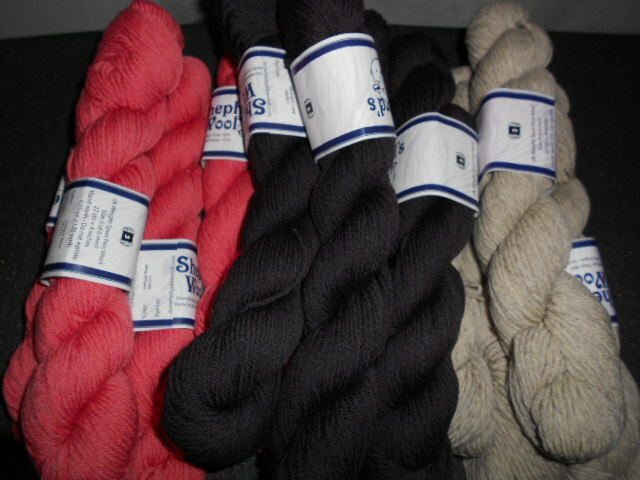 I’ve got plenty of yarn so shouldn’t run into any problems with enlarging it a bit. If I remember right the pattern instructions say it’s just shy of 10″ wide by 75″ long. I’ll continue increasing until the width is about 12″ for the widest section where I stop increasing and just add length, and add another foot or more into that section in length too before the decreasing starts again. I ran a few errands today, watered the garden which was extremely wilty looking. I didn’t water last night because it was thundering and thundering while I was sitting out on the patio knitting and sipping my coffee yesterday evening and the sky was really black, but it all blew past us without a drip. 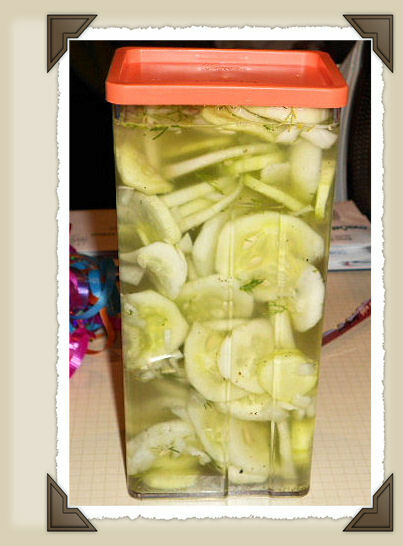 I did pick a couple of cucumbers so tomorrow I can make some sweet and sour cucumbers and have dill from my dill plant to add in. Yum. And I picked a couple of bell peppers. 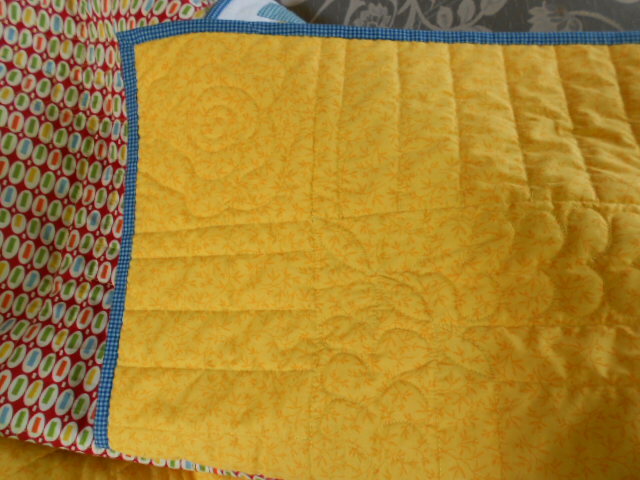 The rest of the afternoon was spent working on my Camp Loopy sewing project 3. 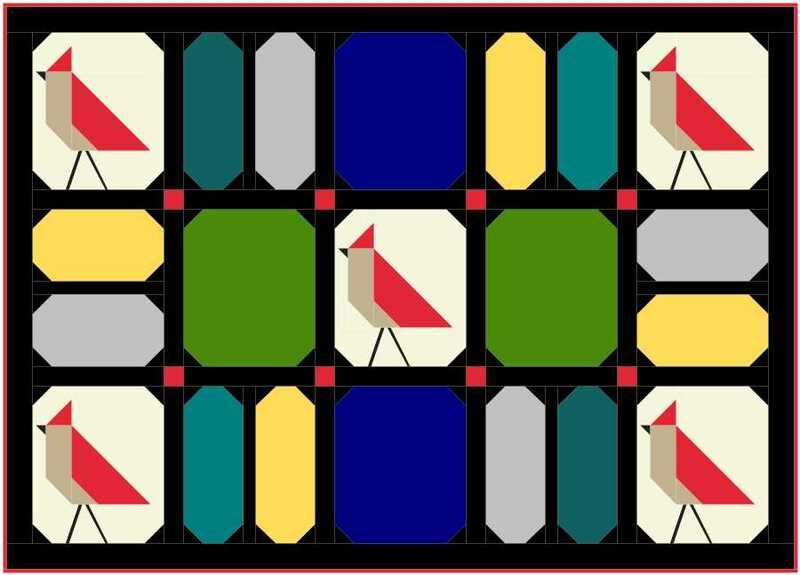 So far, I’ve got all the pieced bird blocks finished. I’m hoping to get the rest of the filler block pieces cut tonight so they’ll be ready to stitch on tomorrow. The Lady Edith yarn will become Zigzagatory. I love scarfs that are long and skinny. 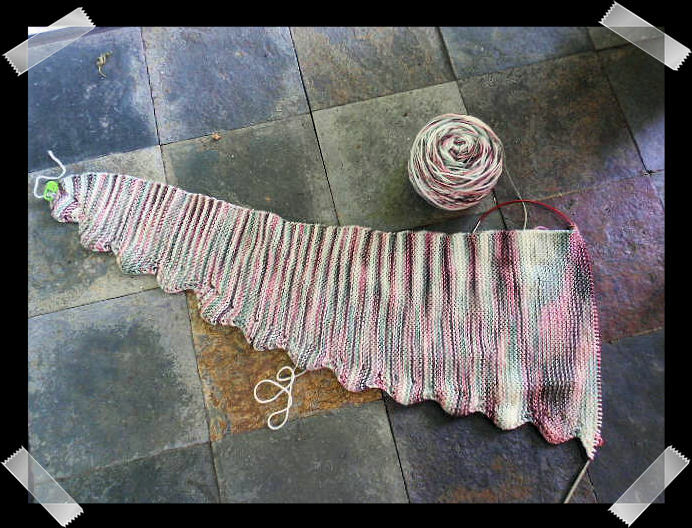 Most regular shawls are not long enough or wide enough for my liking. Many can be altered but some can’t and I love ones like that that could also easily be made longer . It will be interesting to see how my yarn knits out in this one. I do already have plans after camp loopy to put some of my Zauberball or one of the other long color change yarns to work in a second one. So my project is set – I will NOT be changing my mind again. But my list is growing longer of things I want to make once Camp Loopy is finished. 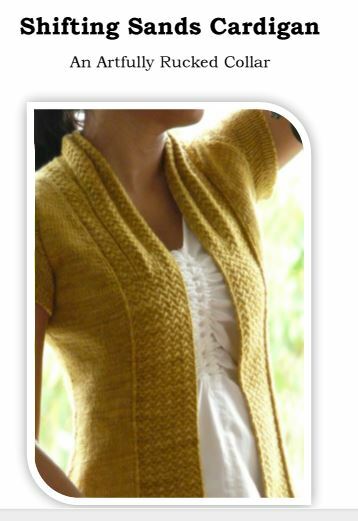 Shifting Sands Cardigan to be released as a CustomFit pattern and it finally is. I love the way this gorgeous collar lays and extends down the front. Tho I’m not a fan of actually making cables and having to fiddle with that cable needle, I will do so for this pattern. 🙂 It also doesn’t hurt that the color yarn this one is made in is so gorgeous. There’s a few changes I will make when I get around to making this – and because it’s CustomFit, I can easily do it – just because it’s my personal preference (and because I am not shaped like her. ) LOL I would have the fronts of my version come a bit closer together in the front and my version will have longer sleeves. I don’t know if they’ll be elbow length, 3/4 length or long, but I can’t wear that little tiny sleeve it has. But those changes are simply made by typing in the type of sleeve I want (elbow, 3/4, long) and changing the inches for the gap in the front of the sweater and the magic CustomFit elves will generate the pattern just for my specifications. I do have enough yarn of one color in the stash – heavier weight for the main sweater body and the same color in lighter weight for the collar but it’s much to variegated and if I’m going to do that stitch pattern and deal with cables, I want them to show up. But I’ll contemplate yarn choices for it another day. 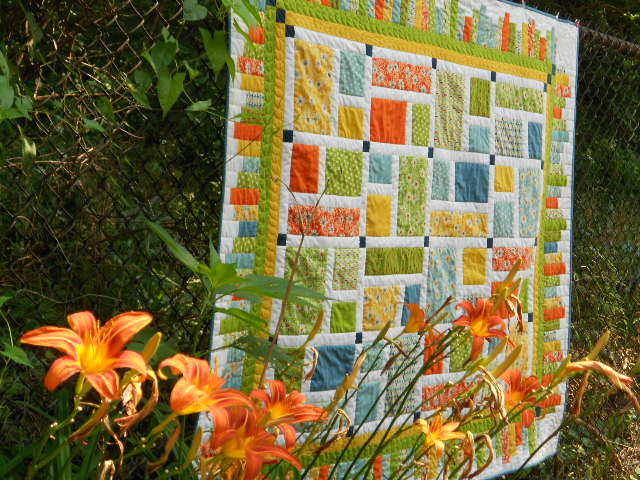 There’s Camp Loopy projects to start on August 1 so need to get those finished first. Now off to knit on my CustomFit Summer KAL Sweater. I’m up past all the armhole shaping so it’s about 60 or so rows on the straight away before I bind of some neck stitches and then just finish the shoulders. I’m on vacation after Friday for a while so plan to ignore the computer and the phone, do a lot of knitting and sewing – hope to get another quilt top or two quilted (maybe clean up the sewing room mess yet again before I start quilting) sit on my patio and sip coffee in the early mornings before the mosquitos descend while everyone else is headed to their jobs, and visit with family for a few days. So Dog Pound Pals, I left a message on the secure page for you which basically says, I may or may not be in town the day the next blocks are to be announced but since we only have two dog blocks left, you know which ones to make! 🙂 Guess it’s time for me to figure out where we go from here (actually I have a plan, I just haven’t drawn it up yet). I did get busy with my quilt backing before going to veg and knit in my chair last night. Backing was pieced and I even got things layered so I’d be all ready to start pin basting this morning. Going to have to restock the batting supply. There’s just one left in the closet. I did also get the back of my KAL sweater to the point where I’m ready to start the armholes. I love it when I get that far – the rest seems to go fairly quickly from that point – all those shorter and shorter rows – so hope this one does too. Time for a coffee refill, grab the tin of pins and get this show on the road while I try to figure out just how I want to quilt this one. 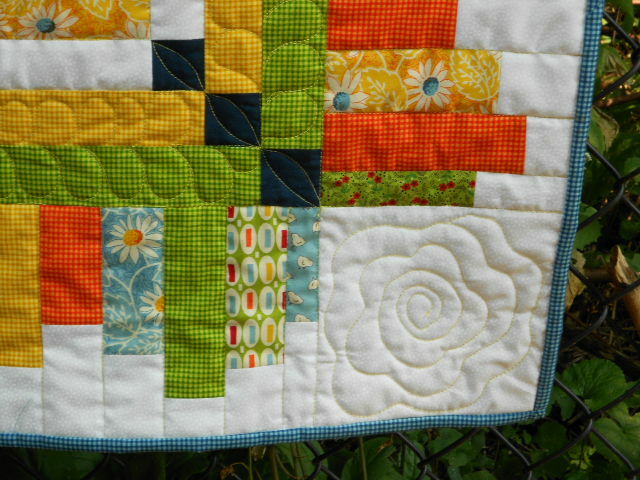 So here’s what I plan to make for my Camp Loopy 3 – the Fabric Version – project. It may look familiar since it is actually a slightly rearranged portion of the design I did for Hoffman California Fabrics Winter Greetings fabric line last year. The colors shown in it have absolutely nothing to do with the fabrics I’m using – they are just placeholders for how I plan to space out the prints. The background will be made up of a bunch of different black tone on tone fat quarters which are from one of the Short Stacks I need to use. And the other larger colored areas will be the Charley Harper Short Stack – prints that I don’t want to cut up much. And there’s a tomato colored solid mixed in that short stack which I would have enough to do the birds and cornerstones but I got it in my head it really needs the tomato color for the binding too. So… yep you guessed it.. my original order of fabric hasn’t even arrived yet and I had to order more of the tomato and since I was at it I ordered both a cream and white since I’m not sure whether the background in the CH prints are more white or cream, and just for good measure a gray short stack. 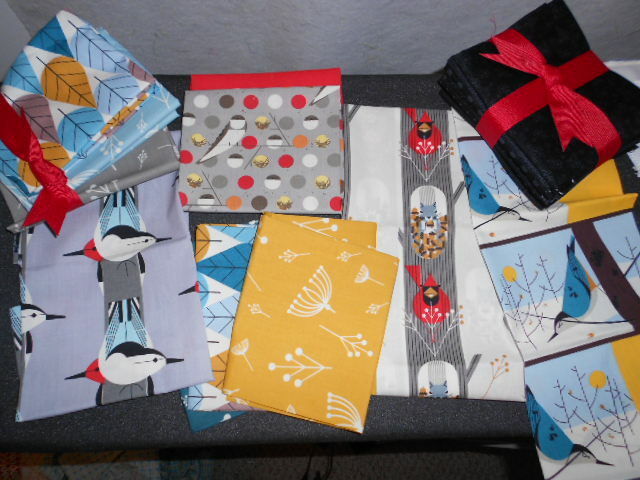 I’ll use the gray for the bird bodies and I love gray fabrics anyway so whatever I don’t use will join the stash.